The enfant-terrible of today collaborated with artist Aleksandra Mir to hand-draw “fake news” headlines on an elevated range of clothing. 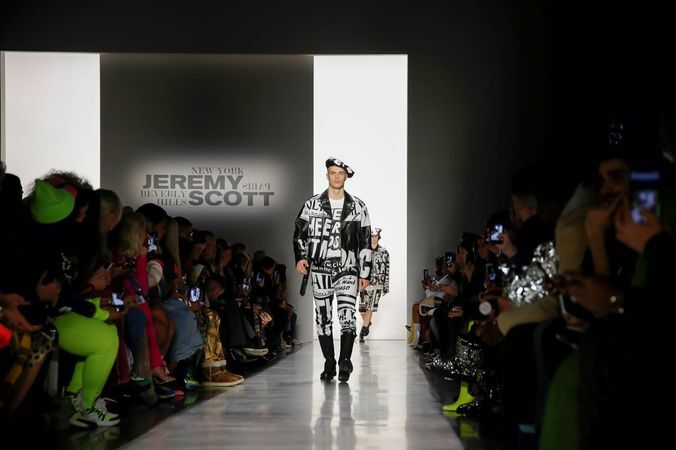 Newspaper prints and headlines as design motif have hit the runway before, most notably done by Jean Paul Gaultier, who turned them into a signature. But during a week when The New York Post headline writers have had some particularly good zingers — “Bezos Exposes Pecker,” and “Hard Times for Pecker” among them — it was particularly timely to see Jeremy Scott put his own spin on the concept for the Trumpian fake news era. The enfant-terrible of today collaborated with contemporary artist Aleksandra Mir (he read about her in “ArtForum,” not Instagram, so there) to hand-draw headlines from the Post and New York Daily News on an elevated range of clothing that not only included his streetwear bread-and-butter (denim, biker jackets, puffers and the like), but also Fifties party dresses and layered chiffon gowns with marabou-feather trim. What made this black-and-white collection read “Extra! Extra!” as well was Mir’s artistic hand-lettering on words like “Scandal,” “Chaos” and “Tragedy” (reminiscent of Stephen Sprouse, to be sure), paired with Scott’s handmade techniques. A Swarovski crystal mesh sylph of a dress was blacked out with paint to let the graphics show; a sequin tailcoat was screen-printed like a punk T-shirt; newsprint denim was distressed into shredded fringe, and clear plastic trenches were collaged with patches as aggressively as the words that screamed out from them. The work made the collection way more than a cheap thrill. Museum gods, there’s a hot tip.